This is a trail on the western slopes of the Catalina Mountains below Samaniego Ridge. Most of these trails in this area are used as mountain bike trails but do see some hikers, especially as you get higher up on the slopes of Samaniego Ridge. There is a maze of trails in this area many of them are not official named routes. Signage in this area is nonexistent. 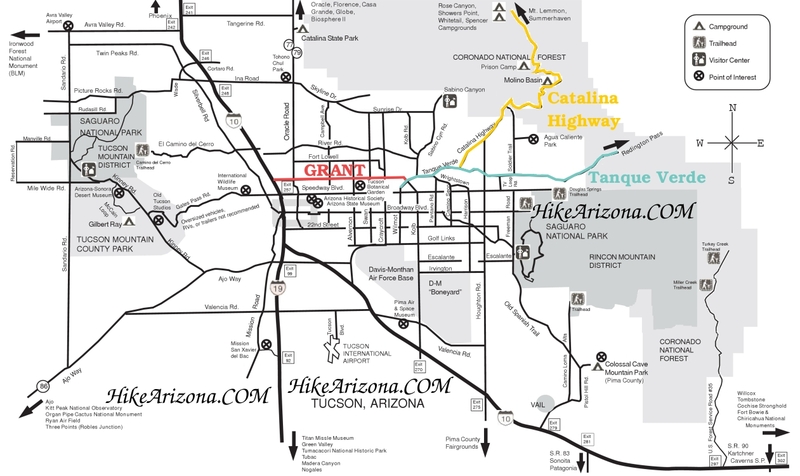 This trail is entirely on State Trust land and a State Trust Land Permit may be required. I was informed by the locals that hiking in the area didn’t require a permit but parking on state Trust Land probably does. The rules for State Trust Land require that you get a permit if entering Trust Land. I went on line and got a year pass for $15.00 to be on the safe side. The Majority of the trails in this area are on National Forest but the Trail Heads are on Trust Land. Access to the Chutes Loop Trail is from the Golder Ranch Road Trail Head via the 50 Year Trail. This 1.5 mile trail forms a loop around a short tributary of Canada Del Oro Wash. The terrain is hard decomposed granite alluvial fill and makes for smooth trails and slippery gravel when going up or down hills. The trail is easy to follow and by the looks of it gets a lot of bike traffic mostly on weekends. I walked the trail but I could imagine on a bike it could be quite fun. Probably walking during heavy bike use is dangerous especially on the lower end of the loop as there are a lot of blind corners. I know bikes are to yield to horses and hikers but it’s kind of hard for them when they come around a corner and there you are. This is not a trail you would probably pick for a hike but as a segment of a larger loop hike it is available. To the immediate north and west of this trail is the border of the State Trust land and the beginning of ranch style homes. The main loop trail is not marked but appears to be the one most heavily used. If you take one of the side trails by mistake I wouldn’t worry it will connect back up to the loop somewhere. There is a trail that heads to the north from the northern part of the loop and appears to head toward the border of the State Trust Land and onto a road near the ranch houses (This may be an access point not on state trust Land).